In 2009, when Justin Wetherill dropped his brand-new iPhone 3G and shattered the screen, the self-proclaimed tech geek ordered the replacement parts online and tried to fix it himself. That attempt wound up further damaging his phone, but it also inspired him to launch an electronics-repair business called uBreakiFix. Wetherill, then 21, and his college friend David Reiff bought broken phones on eBay and learned to fix them through trial and error. They set up a website and started repairing broken screens via mail in a living room. Once they realized people wanted a quicker turnaround, the pair started meeting customers in person. Wetherill maxed out his credit card to the tune of $5,000 to get the business going. Another friend, Eddie Trujillo, suggested they open a brick-and-mortar location. Initially, Wetherill and Reiff didn’t want the risk of a storefront, but Trujillo put up the money and they opened their first store in Orlando, Florida, in September 2009. At $800 per month in rent, the store wasn’t in the best part of town. Still, in that store’s second month of business, it already surpassed sales from their website serving the entire country. 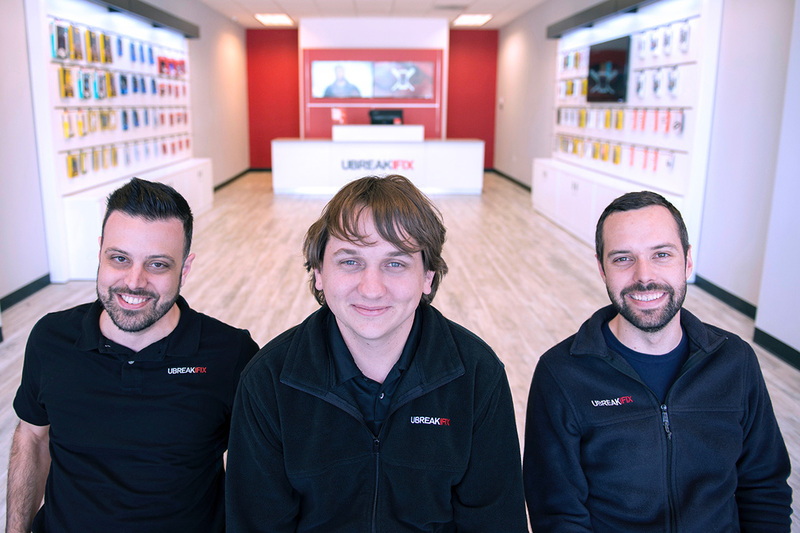 Between 2009 and the end of 2012, uBreakiFix opened 47 corporate stores. After building a portal to track metrics, like sales, employee hours and parts availability, they made the leap into franchising in 2013. “We were at a point that we could comfortably share the model with people outside of the system and drive a consistent experience,” Wetherill says. The company now has more than 290 locations, including franchises in the U.S., Canada, and Trinidad and Tobago. Wetherill says he plans to end the year with 450 uBreakiFix locations. Total storefront revenue hit $98 million last year, and they’re projecting $140 million in revenue this year. “The big challenge […] is changing the mindset of society that electronics are worth fixing and they’re not just disposable,” Wetherill says. In fact, earlier this year, the company surveyed 1,000 people about what they do when they break their phone: Only 24% even considered repairing it. In many cases, repairing broken electronics is not only cheaper than replacing them, but it’s also more eco-friendly. I asked Wetherill to share his best advice for aspiring entrepreneurs. Here’s what he told me. Rather than jumping right into a commercial lease and the stress of a physical location, Wetherill started small and proved there was demand for this phone-repair service. While working as an accountant, Wetherill realized the office life wasn’t for him. He tried several business ideas, including selling T-shirts and building computers, before finding one that worked. While uBreakIFix started out fixing phones, it now repairs other electronics as well, including computers, tablets and game consoles. Although he didn’t originally want the risk and overhead of a brick-and-mortar store, Wetherill’s willingness to change his position and take that leap paid off big-time. Wetherill hired his friends early on, a strategy that burns some business owners. He says holding people accountable has kept them working hard instead of coasting on friendships. “We have created a culture where we try to very clearly outline what success looks like in a role,” he says. To spread goodwill with potential customers, uBreakiFix offers free diagnostic tests on things like checking your battery’s charge. “If it’s something that a technician can just fix quickly right there at the front desk, then we do that and send people on their way,” he explains. Your Turn: Have you ever wanted to start a business? What service or product can you offer to fill an unmet need? Susan Johnston Taylor (@UrbanMuseWriter) is a freelance writer who’s contributed business and personal finance stories to The Atlantic, The Boston Globe, Entrepreneur, Fast Company and U.S. News & World Report online. She lives in Austin, Texas and gets her frugal Yankee habits from her mother’s side of the family.